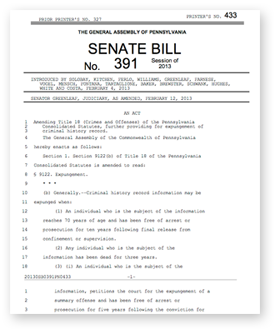 What does SB 391 do? The current law states that crimes other than misdemeanor offenses cannot be expunged until after the offender turned 70 years old or has been deceased for more than three years. SB 391 will allow some individuals who have been convicted of misdemeanors of the 2nd and 3rd degree to apply to have the records expunged if they have not been arrested or convicted for 7 to 10 years (depending on the offense) prior to requesting the expungement. Contact your local state senator and to tell them to vote yes on SB 391, the expungement bill.